Yes, at last! And this is but the first of a long series of articles that should begin with: OMG, it’s sooo overdue, I’m so sorry. Should but won’t. We don’t do apologies very well but we will write about a million things between now and Christmas and hope our hard-to-resist natural charm will stand in a good stead of an apology. We are not quite as lazy as it may seem on the outside, we have been very busy lately. I know, that’s what they all say. Anyway. Connemara Turf Mór (click on the picture to enlarge). Woohoo! Cooley have done a really good job supplying samples of this to the blogosphere and I am sure you have already seen adequate write-ups. So I won’t copy my respectable blogging colleagues and friends and I won’t tell you what and how. Instead, very much EWB style, I will tell why. Why you can not miss this one, to be precise. Nose: Burning grass and damp hey play background to melting lollipops and cut flowers, all with a twist of lemon. Hint of white chocolate. Balanced, clean and fab for such a smoky customer. Palate: The game is on. At first warming and cerealy, then floral big time and then smoky! Linseed oil and leather prominent but not overpowering. Even at cask strength it’s oily and sticky. With water it becomes diesel-like in texture. Finish: Burned rye bread, rose petals and Parma Violets. Long and satisfying. 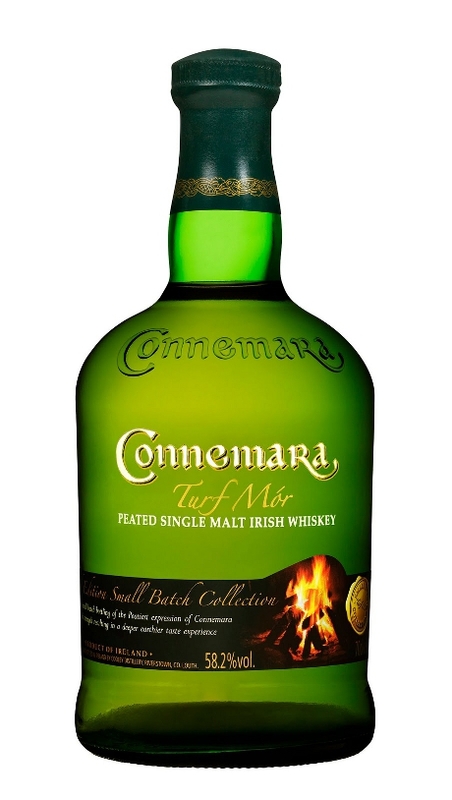 Overall: Full bodied and full-blooded peaty bad boy boasting complexity and kick. But don’t be mistaken, it is not an Islay-style whisky, it’s a different beast altogether. While being smoky and oily, it shows sweet Irish finesse with that lollipop/roses theme, it’s clean and juicy. The likes of peated BenRiach or Tomintoul are always a failure. Ardbeg, Laphroaig, Talisker – always a success. But if you thought there were only 8-9 distilleries that could do 100% perfect smoky whisky and that they were all on (small) islands, think again. Ardmore has been up there for ages, St. George’s peated juice is coming along beautifully, so is Knockdhu’s. Not to mention the Japs. And now this cracker. This is getting fun! And why does it not surprise me that this came out of an Irish whiskey distillery? Them bloody Paddies have been going from strength to strength recently. Did you read about Jameson selling 3 million cases this year? Feckin’ hell. I could not be happier for them. I genuinely love Irish whiskey, Chris and i have been cheering them for ages now. I think it can only do Scotland good if they have a strong competitor within the category breathing in their necks. History shows that one superpower in a region is never a good idea. This entry was posted	on Thursday, December 16th, 2010 at 5:57 pm	and is filed under Reviews. You can follow any responses to this entry through the RSS 2.0 feed. Responses are currently closed, but you can trackback from your own site.